source - Although I think this particular pic is for a recipe that includes nuts, my recipe doesn't. ﻿﻿﻿﻿I first had Oatmeal Carmelitas in college. It's the one thing (besides cereal) that I actually liked in our college cafeteria. But I didn't know they were called Oatmeal Carmelitas at the time . . . I just referred to them as "little bars of absolute deliciousness" - it's cumbersome but accurate. Me: You know those little bars of deliciousness with something kind of crunchy but sweet on top and some melted chocolate and maybe a few other things. Me: Come on. You know . . . crunchy stuff and chocolate and other stuff all in a bar-type thing. Finally after years of searching, I gave up . . . assuming that these little bars of absolute deliciousness were some sort of magical concoction mysteriously whipped up in the secret depths of my college cafeteria. Then about three years ago, I was at a meeting and I picked up one of the desserts on the break table. I bit into it and . . . (take a moment and listen to the choir of angels signing) . . . yes, although not EXACTLY the same, that dessert bar was very close to those little bars of absolute deliciousness from my college days. I hunted down the person who brought them, (I may or may not have shouted at the top of my lungs for all to hear, "WHO MADE THESE BARS? TELL ME RIGHT NOW! "), and found out these bars were called . . .
After tweaking her recipe, I think I've pretty much mastered them . . . but I still like to refer to them primarily as little bars of absolute deliciousness. 1. Preheat oven to 350 degrees. Spray one 8x8 inch square pan with cooking spray. 2. Combine the 1 cup flour, baking soda, oats, brown sugar, salt and melted butter. Mix to combine, mixture will be very crumbly. Press firmly half of the mixture into the bottom of the prepared pan. 3. Bake at 350 degrees for 10 minutes. 4. Let cool slightly then sprinkle over the crust the chocolate chips. 5. Mix the caramel ice cream topping with the 3 tablespoons of flour and drizzle over the chocolate chips. 6. Top with the remaining oatmeal mixture. 5. Bake at 350 degrees for 15 minutes. Let bars cool a bit before cutting so that the melted chocolate will harden a bit. Unfortunately, I haven't had the time to make these yet, but they are HIGH on my to-do list for the weekend. My mouth is sooooo watering right now. Oh my they look amazing! If you need to pawn any off on anyone feel free to send them my way! This is a fabulous recipe. One of my friends will always be my friend because she made me these...and gave me the recipe! Oh adding these to my recipe collection on my blog. Little bars of absolute deliciousness indeed!!! Thank you, I think! The picture looked tempting and then I spotted the recipe, uh oh there goes starting the diet before Christmas! But yes, my mouth is watering too. I love crunchy-sweet oatmeal with chocolate. Adding these to my treat list! I MUST have some I MUST! I printed out the recipe....thanks for going through the trouble for us. My taste buds are dancing...can't wait to try them. oooo... those look delicious!! 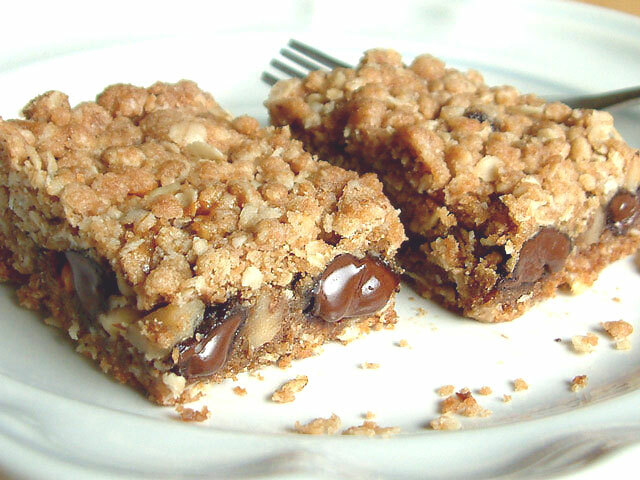 I thought these were going to be what we call "magic cookie bars" but they are different. Can't wait to try these. So how many of these are too many to eat in one sitting??? Super yummy Elizabeth - thanks for the recipe - they're a new favorite!! Every Christmas, I pick something new to bake along with our 'tried-and-true' recipes. This is it--thanks!